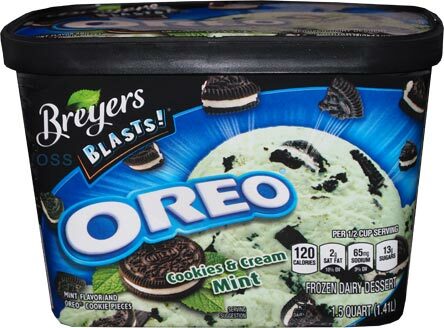 I was going to post this earlier in the month, but then that other Breyers mint cookie flavor showed up and this review got bumped back. Basically this is a quick review of me filling a void in our Breyers Blasts coverage. 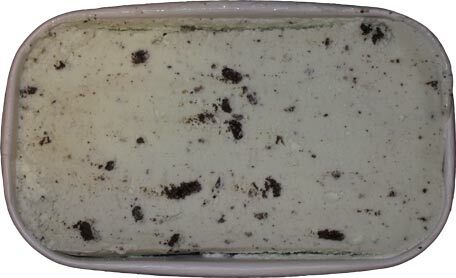 Funny, the light nature of the frozen dairy dessert is great at conveying the effervescent nature of the mint base. At the same time, there is also muddle factor to it. It's not a clean, crisp all natural mint, it's more... iunno, fluffier than that. Overall though, it's not bad. I mean it's very low fat and can fix a mint craving. Sure I would love more of a cookie factor here because it's playing a little too delicately for my tastes, but overall, not bad. I like competition in the cookies & cream space, it's a basic concept yet has a million variations if companies would just give it a chance. We've seen coffee cookies & cream from a few folks, so I don't see why every base doesn't have a C&C variant. Oreos are milk's favorite cookie but chocolate chip cookies go just as well with milk. I would love to see a flavor that has either just chocolate chip cookies as the only mix in or chocolate chip cookies and chocolate chip cookie dough as the mix ins. It seems like a no brainer especially with the popularity of cookies and cream, so I am surprised no company has tried this yet. If executed right, it could be a big hit, and I think companies are missing out. with everyone making a cookie dough flavor, most dont bother with actual chocolate chip cookies. 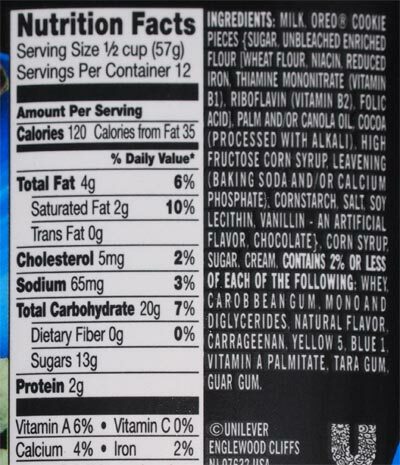 And don't forget Ben and Jerry's has a milk and cookies variety that I think is pretty good. HA! I will never forget about B&J's Milk & Cookies flavor, love that stuff! I guess it does technically fit the request here. Breyer's Chips Ahoy! Blasts have a fudge swirl which ruins the entire ice cream and Ben and Jerry's Milk and Cookies has chocolate chocolate chip cookies and a cookie swirl. I just want an ice cream flavor with chocolate chip cookies and nothing else but the ice cream base - no swirl and no other cookies. Less is more. Stride, buy your favorite vanilla ice cream and crumble your favorite cookie over top. Problem solved! Nick, I have thought about that but the problem is that I like the cookies soft, so if I add my own cookies in, they will be crunchy. Perhaps I can soften the cookies in milk before adding them into the ice cream. Stride, not sure why your cookies would have to be crunchy. There are a bunch of soft baked cookies on the market and you can also bake your own and crumble them. Good idea! I forgot about the soft baked, chewy cookies. Thanks!